People sometimes ask me how I’ve managed to write a column every single day since November 2009. Sadly, the answer has a lot to do with politicians having a vote-buying and power-grabbing incentive to produce a never-ending supply of bad policies. Consider what just happened in Oregon. Oregon Gov. Kate Brown signed into law a first-in-the-nation rent control bill Thursday…Senate Bill 608's rent control and eviction protections go into effect immediately. …The law caps annual rent increases to 7 percent plus inflation throughout the state, which amounts to a limit of just over 10 percent this year. …The bill passed quickly through the House and Senate amid a Democratic supermajority. This is spectacularly bad policy. My first reaction is that such laws should be unconstitutional since politicians are violating a provision of the Bill of Rights by taking part of the value of private property without compensation. My second reaction is that such laws will backfire because they address (in a bone-headed fashion) the symptom of rising rents rather than the (usually government-caused) problem of inadequate housing supply. My third reaction is that price controls never work, regardless of the market or sector, so limits on rent will exacerbate housing problems. Berlin is contemplating rent control as well. …local politicians here have proposed a radical idea to tackle the problem: introducing a rent cap that would freeze all existing rents for the next five years. …By freezing existing rents for five years, Zado said, the city could help prevent massive increases. …but there could also be significant downsides. Such a policy could exacerbate the city’s existing housing shortage: some experts say it might lead developers to seek buyers, not renters, for their new apartments. …said Michael Voigtländer of the German Economic Institute in Cologne. “That lack of housing won’t be solved if the rents are capped.” …head of the German Housing Industry association, told German newspaper Die Zeit it could even keep developers from building additional housing in the coming years: “A rent stop would lead to our member companies building about 50,000 fewer apartments in the next five years,” he said. The national government also is acting in a self-destructive manner. Germany has taken nationwide action in recent years to begin grappling with this problem: in 2015, parliament passed a law restricting how much landlords could raise rents. Under that legislation, the rental price on a new contract should be no more than 10% higher than the average price in that particular neighbourhood. Let’s see what experts have to say about this issue. We’ll start with the perspective of landlords, which was included in this New York Times report. …landlords say that the legislation will compel owners to take their properties off the rental market because they will no longer be able to earn enough rent from them — deepening the housing crisis rather than easing it. …Mr. DiLorenzo said his primary fear was that lawmakers would ultimately bar rents from rising more than a bare minimum, which would prevent landlords from meeting their expenses and eventually drive them out of business. The real solution to rising rents, he said, is to make it easier to build decent and affordable housing in Oregon by eliminating a multitude of fees and regulations. Landlords have an obvious interest in this issue, so let’s now share some insights from people who don’t have a dog in the fight, but who understand economics. Megan McArdle debunks this inane example of price controls. Serial experimentation with this policy has repeatedly shown the same result. Initially, tenants rejoice, and rent control looks like a victory for the poor over the landlord class. But the stifling of price signals leads to problems. …incomes rise, and rents don’t. People with higher incomes have more resources to pursue access to artificially cheap real estate: friends who work for management companies, “key fees” or simply incomes that promise landlords they won’t have to worry about collecting the rent. …lucky insiders come to dominate rent-controlled apartments, especially because having gotten their hands on an absurdly cheap apartment, said elites are loathe to move and free up space for others. The longer the rent-control policies remain, the more these imbalances grow. …Deprived of the ability to make a profit, landlords skimp on maintenance and refuse to build new housing. Megan also explains that the damage of rent control is compounded by policies that restrict the development of additional housing. Rent control is one of the most effective ways to destroy a city’s housing stock, but it’s far from the only one. You can also enact extremely strict building codes, with lengthy and highly bureaucratic processes, which will restrict the supply of housing. This is what has happened in many American cities… policymakers should remember that a price is just the intersection of supply and demand. If you alter the price, but don’t alter the supply or the demand, the problem doesn’t go away; rationing just shows up in different forms. Mark Hemingway, originally from Oregon, explains in the Wall Street Journal what is happening in the state. Virtually every mainstream economist, from Paul Krugman to Thomas Sowell, has condemned rent control as bad policy. Oregon’s problem isn’t rising rents. 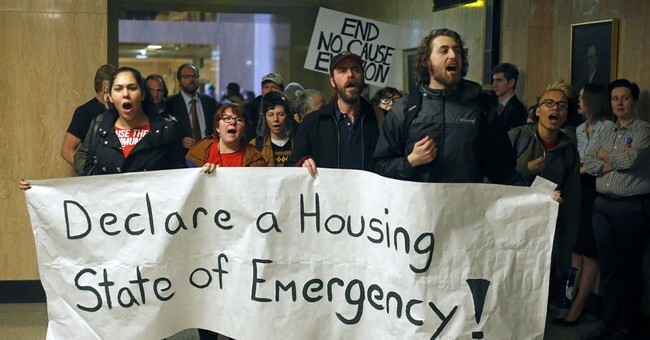 It’s the lack of affordable housing… the state remains resistant to new development. Oregon adopted widely hailed “smart growth” policies in the 1970s, imposing “urban growth boundaries” around cities to prevent sprawl. …This has artificially inflated the price of land within the boundaries. …On top of all this, Oregon has a red-tape problem that skews developer incentives. “Systems and development charges and permit fees for even a 500-square-foot unit in the city of Eugene right now are close to about $20,000 per unit,” says real-estate agent James St. Clair. “There’s no incentive to build small affordable units…” Rather than addressing the lack of housing supply, legislators have seized on rent control. For those who prefer videos over words, here’s a succinct video from Johan Norberg on the folly of rent control. Mark Perry of the American Enterprise Institute summarize the real problem in a column for the Foundation for Economic Education. …rent control is making a comeback in response to rising housing prices in urban areas across the country in states like California, Illinois, Washington, and Massachusetts. 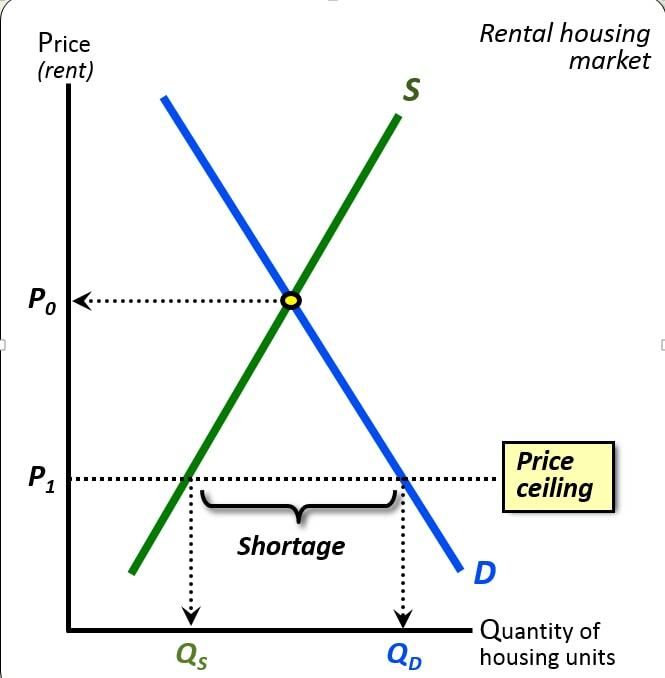 …As the graphical Supply/Demand analysis…illustrates very clearly, rent control laws that artificially force the rental price of housing (P1 above) below the market-clearing equilibrium price (P0) are guaranteed to create a housing shortage by: a) increasing the number of rental units demanded at the artificially low rents (QD) and b) decreasing the number of rental units supplied to the market (QS). You can artificially restrict the amount of rent a landlord can legally charge for a rental unit, but you can’t force developers, builders, and landlords to build or supply more rental housing in the future. And the supply of rental housing in markets with rent control is guaranteed to decline. …Price controls aren’t the answer. Building more housing is the only real solution to increase the supply of affordable housing. In another column for FEE, Luis Pablo de la Horra summarizes why rent control is so misguided. Rent control is one of those policies that continues to attract the favor of the public despite the fact it has repeatedly proven to be ineffective when it comes to improving the lives of those it is aimed at. …Rent controls often lead to a shortage of rental houses since landladies and landlords find it unprofitable to rent out their apartments at capped prices. In addition, the stock of dwellings tends to deteriorate because home-owners will have little incentive to invest in the maintenance and refurbishment of their houses. …here is some empirical evidence. A 2017 paper published by three Stanford economists shows that rent controls in San Francisco reduced rental housing supply by 15 percent, which in turn increased rental prices in the other parts of the city by around 5 percent. Another recent paper blames restrictions on the use of land (the so-called zoning) for the increasing housing prices in large US cities. Let’s see what the other side has to say on the topic. Unsurprisingly, the New York Times is on the wrong side. Here are some excerpts from an editorial that is a case study of economic illiteracy. New York’s system of rent regulation, limiting how much landlords can charge tenants, began in the 1940s to help a growing middle class. There are about one million apartments covered under rent-restricting regulations now… here are some actions lawmakers can take: …Return control of the rent laws to New York City… Landlords’ ability to raise the rent by 20 percent every time an apartment is vacated is a perverse incentive… Lawmakers should scrap this incentive entirely. …the state agency that enforces rent laws…needs more funding… require landlords to submit receipts for improvements to individual apartments to the agency and the tenant. This is remarkably bad. And sad as well. The New York Times in recent memory was actually economically sensible, endorsing a flat tax and urging elimination of the minimum wage. Now it fully embraces policies that even rational left-leaning economists condemn. Indeed, you can probably tell a lot about the ethics of your left-wing friends if you ask them about rent control. The ones with good intentions will reject rent control while the demagogues (and the ignorant) will applaud this foolish example of price controls. Minneapolis provides a good example of ethical leftists, as Elliot Kaufman explainsin the Wall Street Journal. Earlier this month the City Council overwhelmingly approved an ambitious plan to encourage higher-density development and increase the supply of housing. …The Comp Plan would allow the construction of duplexes and triplexes in areasonce reserved for single-family homes, rezoning areas near public transportation for larger apartment buildings, and doing away with parking requirements for new housing. …The Comp Plan takes a market-based approach but proclaims left-wing goals. It vows to “eliminate” racial and economic disparities and aggressively fight climate change. …The Comp Plan promotes denser development, which urbanists on both left and right see as the solution to a host of problems. More density in a city like Minneapolis could help renew both geographic and economic mobility. We’ll close with this great quote from a Swedish economist. 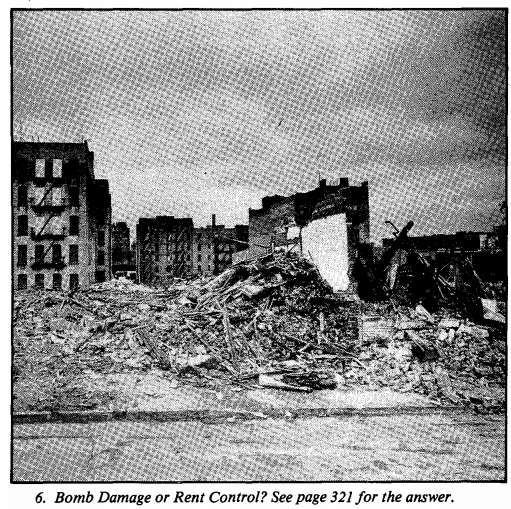 In many cases rent control appears to be the most efficient technique presently known to destroy a city -- except for bombing." P.S. Rent control can be a great scam for privileged insiders. P.P.S. Rent control also rewards and empowers unscrupulous and reprehensible people. P.P.P.S. Amazingly, California voters actually rejected a state referendum to allow rent control (though this isn’t stopping one of their politicians from trying to muck up rental markets).